I love when Melbourne embraces a big game of footy. Not just for a final either, where the stakes are set arbitrarily year to year, but when two strong clubs in strong form heave as one, the cobblestones in laneways seem to ripple. It feels like all the doubts about a silly game and what it means to the fabric of a society become muted and pale. The upshot of all this is that when the two strong clubs have a combined membership of almost 180,000 people (who knows how many pets!) all of that Big Melbourne Energy has to be squeezed into a venue with a capacity of slightly over half of that. Maths was not my favourite subject at school, but I learned enough to know I wouldn’t be strolling up 15 minutes before the bounce if I wanted a seat with those numbers flying around. So I arrived an hour and a quarter before the gates opened, the shortest of the queues already 15 deep. The whole experience was quite pleasant, thanks to some light hearted Twitter banter with fellow Almanacker Jack Banister and an animated conversation behind me featuring a Richmond fan condensing 110 years of rivalry into an easily digestible TEDxMCG talk for his neophyte companion of Peruvian persuasion. Next thing I knew I was scanning my membership and making a mad dash for the front rows of Level Four in the Great Southern Stand. Thanks to a courteous Pie fan minding my seat, I managed to wander down to watch the Richmond VFL side take on their mascot mimics from the other side of the city – one quarter was enough for me, mostly due to the Tiger cubs playing like they were in the position of Geelong ten minutes into the final quarter of the 2007 AFL Grand Final. Lairising would be a rank understatement. Returning to the ‘G with 40 minutes left before game time, the crowd had already swollen to around 65,000. Amazing scenes. The last 20,000 punters in place: siren, murmur, countdown, cheer, siren, roar, bounce! It was clear that Collingwood were no mugs. Those who had downplayed their form based on the past opponents must have short memories – the same critiques were levelled at the Richmond Football Club last year, all the way up until September 30. The opening stanza was marked by Collingwood winning a hell of a lot of the ball, fortunately for us they didn’t do a hell of a lot with it. 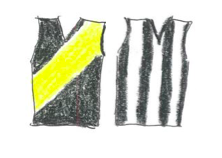 I thought the Pies were the slightly better side until a trademarked pair of “Short goes long” majors by Jayden gave the Tigers breathing room in the closing stages of the term. Entering the second quarter, non-mugs Josh Thomas and Brody Mihocek made short work of said breathing room with goals of their own. A superb goal from Josh Caddy at the other end countered the mini-momentum shift before Mason Cox started clutching marks and kicking goals to resume the Pies’ challenge. 1) Sitting on the edge of my seat, eyes affixed on a seesawing contest where every action was like a move from chess Grandmasters, scored in stereo by The Tiger Army underneath me and the Magpie Hordes of the Ponsford. Audacious. Mesmerising. Genius. Goal of the Year. Snag of the Year. I think everyone who listens to stories from people who were “there” in the “I was there when…” moments can’t help but try to paint a picture in their head about what it was like, swept up in the occasion. Being “there” in the moment, I knew this moment was one of those moments. A prime view of the impossibly nimble goal gave way to shock, awe and the hands of all around me posed in the shape of the three wise monkeys. And a mere 88,000 of us were there to witness it. How extraordinary. Thanks to goals from Riewoldt, Edwards, Townsend, Rioli and Martin, it would be the latter. Not only that, but after being smashed in the clearances at stoppages all day, the Tigers not only nullified the Pies prolific ball winners but also won their own possession more frequently to boot. Ominous signs for the finals. A huge crowd, a city enthralled, “Yellow & Black!” ringing out over Yarra Park – I love when Melbourne embraces a big game of footy! BTW, I agree re the VFL team lairising. I thought exactly the same thing. Ya gotta love Snags. Not many of us get to make up our own nickname. You’ve captured the sense of occasion brilliantly. I know I’m biased but this was a great footy day and a terrific game. At a time where it seems fashionable to put the boot into the AFL at any opportunity, we would do well to remind ourselves of how lucky we are that this competition enables us to enjoy such spectacles so easily, frequently and safely. Both sides will take lots of “glass half full” thoughts from this game. I’m mightily impressed at Collingwood’s improvement this year. Twice now they’ve been right with Richmond at 3/4 time only to be cruelled by Injuries. I wouldn’t discount their chances of 3rd time lucky if they can keep 22 fit men on the park. BTW you omitted to mention that Richmond is currently on top of the ladder. I say this only because we need to counter the fake news that’s circulating on this site about some mob called Norwood heading the table. They sound like they’re a pretty decent team. Perhaps they should join the VFL and give our lairising seconds some decent competition! He’s an absolute steal, young Snags. Such an entertaining kid too! It really was – the “feel” of the day was just bang-on. Nothing for the Pies to be ashamed of, I thought they played 80% of a perfect game. They just lacked the polish to execute once they had the ball at times. 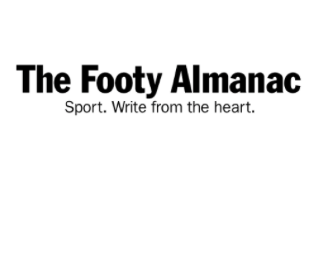 I’ve written before how I’d have loved it if teams like Claremont, Southport and Norwood had joined the VFL 30 years ago – maybe the Redlegs could do it now? I know who I’d be tipping if they took on the Richmond boys who played at Punt Road on Saturday…they wouldn’t be wearing Yellow and Black. Tigers should be happy with the win, made easier with the Pies losing their best 2 defenders during the game and their third best defender already out injured. I wonder how the Tiges would go without their best 3 defenders? The Pies showed plenty of spirit which in the end was not enough. They do not make it easy on themselves either, for example by gifting goals by 1) allowing a Tiges player outside 50 to twice in succession handball off to a player running past to launch it through the goals and 2) by having several defenders go up together to spoil, leaving Tiges players free outside the pack. Feeling for Scharenberg at the moment; knee reco number 3. Btw, that goal by Higgins, even though spectacular, came from throwing the ball back into play. Pies season just about cooked with injuries and inability to beat a top 8 side. Tiges have much to look forward to. You make some good points Bruce & I mostly agree with most of them (injuries in particular). However I can’t get around this “throw” nonsense. A throw is when the ball is lifted or thrown to another player, during possession or in a tackle. If the ball is kicked, you don’t get style points for a textbook ball-drop (which itself is a free kick if you don’t get a boot on it). Goal of the year on Saturday and twice on Sundays. Cheers. Funny how we say ” He throws it on his boot” when in actual fact he’s dropping it . Technically , it was a throw , but far outweighed by quick- thinking inventiveness , for which he gets the chocolates. Well done him , I say , even though I don’t much care for the mob he turns out for.